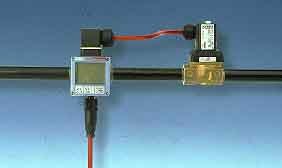 Burkerte 8400 sensor/switch measures fluid temperatures from –40°F to +257°F and features a programmable "switch" set point that can be set either locally with the three push buttons on the display or externally from a PLC/computer over a 4-20mA loop or using FieldBus or ASI-Bus. Applications include both the control of process fluids within a narrow temperature band and the monitoring of min/max levels of temperature in a running process. Equipped with a large LCD display, the unit indicates the actual process value in real time both digitally and simultaneously as an analog bar graph for quick reference. Standard features include the TEACH-IN function and Test Simulation function, which allows setup without actually operating the flow system.